Il triangolo del misticismo - FLORENCE LIVE! 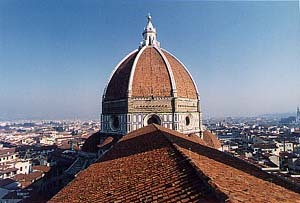 anta Maria del Fiore, Giotto's Bell Tower, the Baptistery. It is the mystic triangle. Underneath the flooring of the Cathedral, are the remains of Santa Reparata, the ancient cathedral dating back to the fourth or firth century. According to the chronicle, it was constructed to celebrate the victory of Stilicone over Radagaiso, King of the Goths, near Fiesole. The date of the battle is August 23, 405, but the legend claims that the liberation from the barbarians occurred on the 8th of October. That day was also the day of remembrance of the martyrdom of the Saint of Cesarea, who had probably appeared in the city waving a flag. The old cathedral had remained functional during the constructing of Santa Maria del Fiore but was completely destroyed between 1374 and 1375. In front of the Cathedral lies the Baptistery, the magic octagon. Seven days of the week are dedicated to man, the eighth belongs to God and to his mystery. There are eight heavenly beatitudes. A giant dominates over the mystic triangle: Brunelleschi's Dome, completed in 1436, not without many problems. The challenge of a 'crazy' man, who proved the skeptics wrong.